Over the last decade, Summit County and White River National Forest has emerged from Colorado’s best kept secret to a world-class adventure destination. Superb backcountry skiing, backpacking, rock climbing, mountain biking, and Colorado’s most accessible 14,000+ ft summits await you just minutes from the glittering resort destinations of Breckenridge, Copper Mountain, and Keystone. 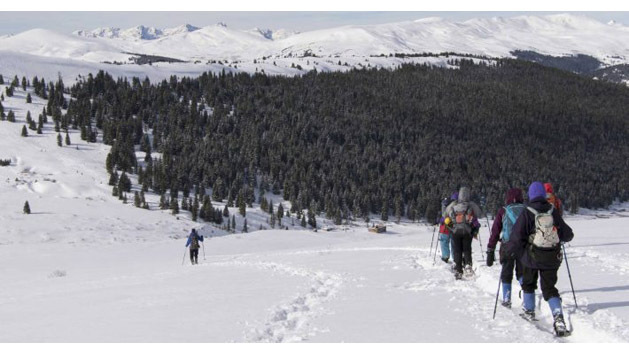 Colorado Adventure Guides offers half and full day guided tours to help you explore the deepest expanses of The County. Because we know that it’s not a good trip until it’s a round trip, trust us to deliver an experience that’s safe, educational, and fun. Colorado Adventure Guides’ core team and network of professional certified guides leverage their skills, experience, and wilderness medical training to customize tours that fit the needs and expectations of individuals and small or large groups. Don’t worry if you don’t have all the latest and greatest equipment. We’ve got you covered, with advice on how to prepare or our complete rental equipment packages to get you outfitted like an expert. There’s no better cardio workout than Nordic skiing along a vast network of trails in Colorado’s White River National Forest, with access points conveniently located near Dillon, Frisco, Breckenridge, and Keystone. We can plan a guided tour in your choice of destinations or take you on a fun tour of one of our favorite places. With our instruction and skills development programs, beginners can quickly learn the nuances of Nordic skiing while more advanced skiers can enhance their expertise to take it to the next level. Complete rental packages are available. Our guides will choose a location that is as close as possible to where you are staying in the county to reduce driving time and increase adventure time. You can also check our list of best nordic skiing locations and choose a location based on your group's desires.